Used with permission from The Handbook of Texas Online. 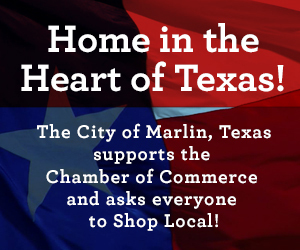 Marlin, Texas, the county seat of Falls County, is at the intersection of State highways 6 and 7, four miles east of the Brazos River near the center of the county. The site was that of Sarahville de Viesca, established in 1834 by Sterling Clack Robertson on the west side of the falls of the Brazos. The town was named to honor John Marlin, a pioneer patriot. Samuel A. Blain, his son-in-law, laid out the streets and lots and drafted a map around a square. Lots for Presbyterian, Methodist, and Baptist churches were the first to be chosen. The Presbyterian church was built first and used as a union church. All three churches relocated east of the square. Zenas Bartlett’s General Store was the first business, and its brick building was used for a school for a short period. Bartlett’s wife later deeded the property to the city as a site for the city hall. Marlin had a freighting business, a tavern, a law office, and later the Green-Bartlett Mercantile Business. The first courthouse was a log cabin; it was used for county business and court, as a school taught by Dr. Giles W. Cain, as a church, as a meeting place for political and community meetings, and as a dance hall. The present courthouse was constructed in 1938-39 after the historic structure of 1887 was declared unsafe. Marlin had private schools before the county was organized. When the Education Act of 1854, under Governor E. M. Pease, was passed, Falls County was granted permanent school lands in Cooke, Wise, and Archer counties. In 1871 a tuition school, Marlin Male and Female Academy, was located on Ward Street north of the public square. It changed names and locations, and the property was finally sold in 1886. Fire destroyed the public school building in 1900, and a new brick school was constructed in 1903. In 1923 the Marlin Independent School District was established. Two community black schools were organized in 1875; they were dependent on state funds and met in the Baptist and African Methodist church buildings. In 1916 the city council voted to build a school for blacks. Later, the school was moved to Commerce Street and was named Booker T. Washington. Teachers and students were integrated in the Marlin Independent Schools by 1970-71. Marlin incorporated in 1867. The Houston and Texas Central Railway completed its line in 1871. The population of Marlin tripled from 500 to 1,500 in a decade. In 1901 a second railroad, the International-Great Northern, laid its tracks into town and dredged a lake in what became the City Park, which is still used as a recreation area, a site for Marlin Festival Days, and as a Youth Center for its Falls County Future Farmer, 4-H Club, and Future Homemaker annual shows. In 1851 the post office was established, and John W. Jarvis, the sheriff and a former teacher, was appointed postmaster. Mail was brought in by stage. The Bank of Marlin was chartered in 1892 and closed in 1963. The Marlin National Bank and the First State Bank have operated since the early 1900s. The Marlin Compress and Cotton Seed Oil Mills were established in 1892 by a board of directors headed by J. A. Martin. The same year hot mineral water was found during the search for an artesian well. Dr. J. W. Cook promoted Marlin as a health center. Bethesda Bathhouse, Majestic Bathhouse, Imperial Hotel, Torbett Hospital, and the pavilion for the flowing hot water fountain were all founded soon after. For the next fifty years Marlin geared its economy to the health industry. Dr. S. P. Rice had an infirmary and drugstore. In 1925 Dr. Frank H. Shaw built a crippled children’s clinic, providing treatment and therapy for handicapped children, including victims of polio and arthritis. He utilized the hot mineral water in a swimming pool and provided other muscle building therapy. This hospital was closed after World War II. There have been several newspapers, including one published by the black community, called the Falls County Freeman, and others of brief duration. 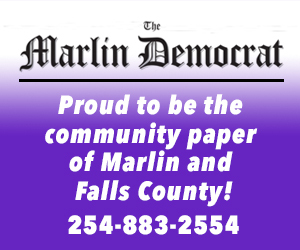 The Marlin Ball began publication in 1874 by T. C. Oltorf and continued until about 1901; then the Marlin Democrat, established by two Kennedy brothers in 1890, became a daily paper about 1898. In 1990 it remained the only daily paper in the county. A weekly, the Falls County Record, was popular in the 1940s and 1950s. Telephones reached Marlin by 1900; automobiles, electricity, and Lone Star Gas soon followed. Marlin had the Peacock Bottling Company, stock pens, a brick yard, a turkey-processing plant, a saddlery, a water crystalization plant, and a pottery plant. By the 1990s there was an auction barn, independent cattle trucking companies, and nursing homes. The population showed a steady increase, peaking at about 8,000 in 1970. The growing number of senior citizens has given rise to federally funded housing apartments, a civic center, two nursing homes, transportation vans, and a new office building for Texas Human Resources. The old Buie-Allen Hospital is a halfway house for girls. In September 1989 the Texas Department of Corrections opened the 1,000-bed William Pettus Hobby Unit. In 1990 the population of Marlin was 6,386. BIBLIOGRAPHY: Roy Eddins, ed., and Old Settlers and Veterans Association of Falls County, comp., History of Falls County, Texas (Marlin, Texas?, 1947). Roy Eddins, ed., Marlin’s Public Schools from the 1840s to 1960 (Marlin, Texas: Marlin Ex-Students Association, 1961). A Memorial and Biographical History of McLennan, Falls, Bell, and Coryell Counties (Chicago: Lewis, 1893; rpt., St. Louis: Ingmire, 1984). Vertical Files, Barker Texas History Center, University of Texas at Austin.